Any idea on creating an Action to disable Windows Sounds (No Sounds), not system mute? I've looked at NirCmd as well, but no option. 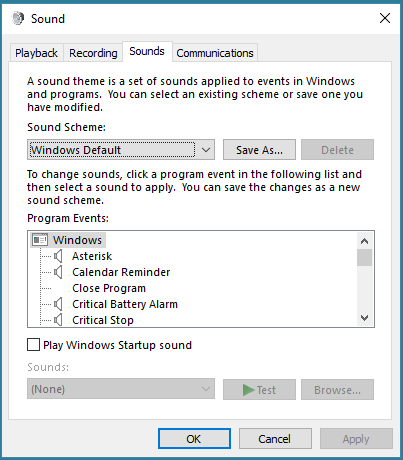 in order to disable windows sounds you only have to stop the windows sound service. Thanks, though that turns off all sound. I would like to simply turn off Windows Sounds (see screenshot). Purpose...when watching media on my Plex Media Player or other media app, I would like to mute all other sounds. I can react to 'Task.Activated.PlexMediaPlayer', as an example. Sorry for the Miss understanding. I took No Sound and Disable Windows Sound as actually turning off the Sound in Windows. You need to be able to control the System Audio Endpoint. I have not tinkered with this bit of it as of yet. But I do not think that an Application can change the volume of another Applications audio endpoint. I think that only the owning application and the user (from the sound control panel) can do this. But what we might be able to do using the windows API is we can possibly change the default sounds to an empty sound file. I am going to have to look into it to and see what we can do.